So before I popped on my holidays I was sent this absolutely stunning swimsuit from Panache. Panache is a brand that of course I had heard of but never looked into for underwear never mind swimwear. I had my pick of the whole range and as I was going away I thought it would be appropriate to choose swimwear. I chose the Savannah Padded Bandeau Swimsuit that is the most stunning purple I have ever seen. With Panache you choose your bra size and not your body size. I went with my usual, 38D and I must admit it couldn't be any more a perfect fit! The cups are moulded and have inner foam cups for extra support so it literally feels like there is a bra attached in your swimsuit which I personally loved as it made my chest look amazing! It can be worn strapless or with straps either as a halter neck or normal but each and every time I've worn this I've worn it strapless. I honestly cant rave enough about the whole swimsuit at all! I have nothing but good to say about it! The print is absolutely stunning and the gold and pink really compliment the vibrant purple. Down to the nitty gritty, the price! This swimsuit from Panache comes in at £49 which you may think is pretty pricey for swimwear. However I do believe you are paying for quality and quality this is! The inner foam cups are amazing and give your bust such a lift and obviously it is fit to the size of your bust not the size of your body. Better still, I have managed to find it on the Very website for 50% off! Making this little beauty a affordable £24.50. You honestly cant get better than that! You can view it on the Panache website here. I make it no secret that I am pretty much in love with Justin Bieber. I have all his albums, know all the words to his songs, have seen him perform 3 times and blast out and sing along to his music in my car at every opportunity. 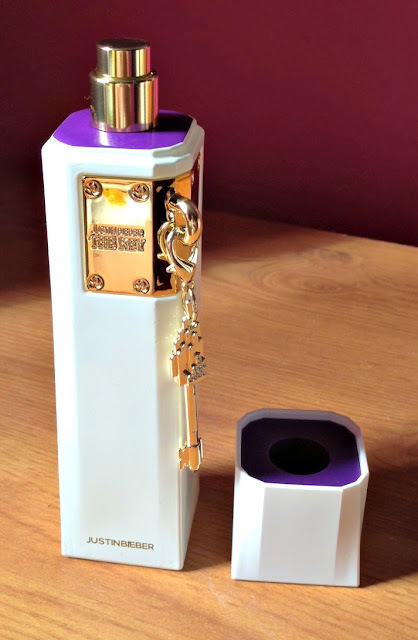 When I found out he was due to release a new perfume, The Key*, I just knew that I had to get my hands on it after owning his first fragrance, someday. It was released in the UK on the 21st August so it is less than 2 weeks old and already sold out in some stores. The box is pretty simple, has a gorgeous picture of the man himself on one side plus lots of gold keys. The bottle itself is white in colour with a gold metal key hanging from one side that can be taken off and attached to something, maybe your keys? In terms of the scent, it really does smell much more grown up than his first two fragrance offerings. It is still floral but not as sugary sweet and fruity as someday and girlfriend and definitely smells more mature. Maybe he was aiming this at his older fans such as myself! It is much more subtle and would be perfect for girls and ladies of most ages. Its available in 30ml, 50ml and 100ml size bottles, ranging from £24 for the smallest and £39 for the largest. You can buy it now from The Perfume Shop. As a massive Biebs fan thi was never going to let me down. Especially as I love the sweet and fruity scents of his first two perfumes. If they weren't for you, this is a much more subtle, powdery, floral scent that is lighter and perfect for everyday wear.